Heading into race week, eight of 10 spots in the gate for Saturday’s Grade 2, $1 million Charles Town Classic appear accounted for, with a group of well-known older horses assembling for West Virginia’s spring feature at 1 1/18 miles. 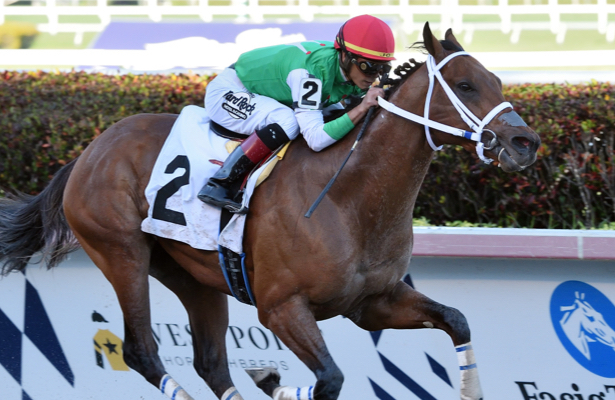 The list begins with Diamond King, who contended in last year’s Preakness Stakes and returned to the races March 22 with an authoritative, 3 3/4-length victory in allowance optional claiming company at Gulfstream Park. Trained by Jason Servis, Diamond King, a son of Quality Road, had jockey Jose Ortiz in the irons that day. Last year’s 1-2 Charles Town Classic finishers, Something Awesome and War Story, are both expected to return along with Discreet Lover, the Grade 1 winner who contended in the 2018 running. From the West Coast, the recent Santa Anita Handicap (G1) third-place finisher, Mongolian Groom — 3 3/4 lengths behind the dueling Gift Box and McKinzie — is expected to ship in along with the Todd Pletcher-trained stakes winner Rally Cry and Nanoosh, last year’s Zia Park Derby hero. Representing the locals, West Virginia-bred Runnin’toluvya, a winner of eight straight at the bullring track, will take the big step up in class in the Charles Town Classic. Stakes purses will total nearly $1.3 million with first post time 12:30 p.m. ET and the Charles Town Classic at 5:37 p.m. A $100,000 guaranteed Pick 4 will encompass all the stakes — on the undercard are a trio of six-figure unrestricted events — while the jackpot Pick 6 on Races 6-12 will see a mandatory payout.